CrestClean’s Sandeep Kumar hands out pizza to the winners of the Cleanest Classroom Award. A pizza prize was the incentive that kept these kids on track to win a tasty treat for having the tidiest classroom. The Methven Primary School youngsters impressed CrestClean’s Sandeep Kumar by ensuring their classroom was not left in a messy state at the end of each school day. The Cleanest Classroom Competition is run at many of the 474 schools that are cleaned by CrestClean business owners. The classroom that is kept the cleanest in the school is rewarded with a certificate and pizza at the end of term. Methven Primary School Principal Chris Murphy says the competition is working extremely well. “The award is a great incentive not only for the kids but also for the teachers. Chris says the award helps to reinforce important values to children. “Our overarching message is the cleaners are actually not there to tidy up after kids, their job is above that. Sandeep and his wife Richa Kumar took over the cleaning duties at Methven Primary last year after relocating to the South Island from Auckland. Their dedication to the job and the high standard of their work has not gone unnoticed, says Chris. “They’ve made themselves part of the school. We really enjoy having them as part of our school family. And he acknowledged CrestClean’s South Canterbury Regional Manager Robert Glenie for his efforts. “Rob has been fantastic to deal with,” he said. The Cleanest Classroom Award has also been a big hit at another South Canterbury school. 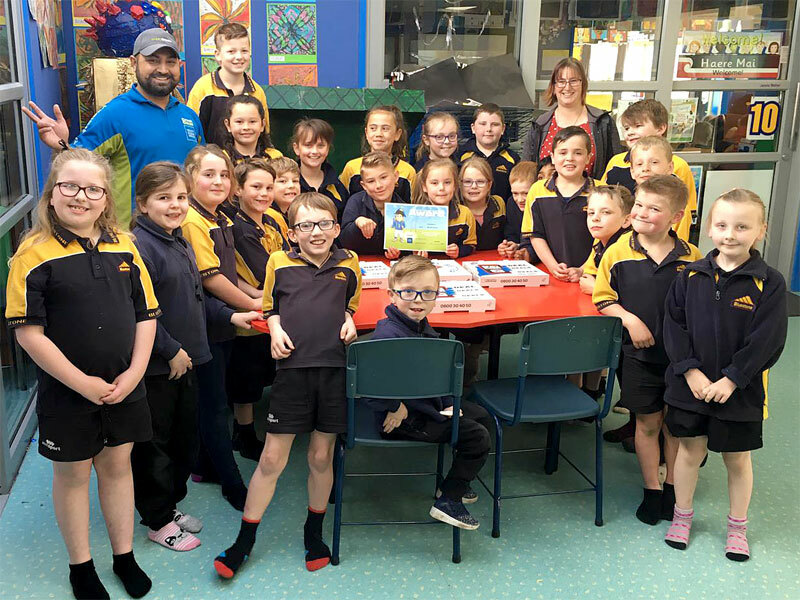 CrestClean business owner Randeep Singh put a smile on young faces when he handed out pizza to kids at Bluestone School, Timaru. 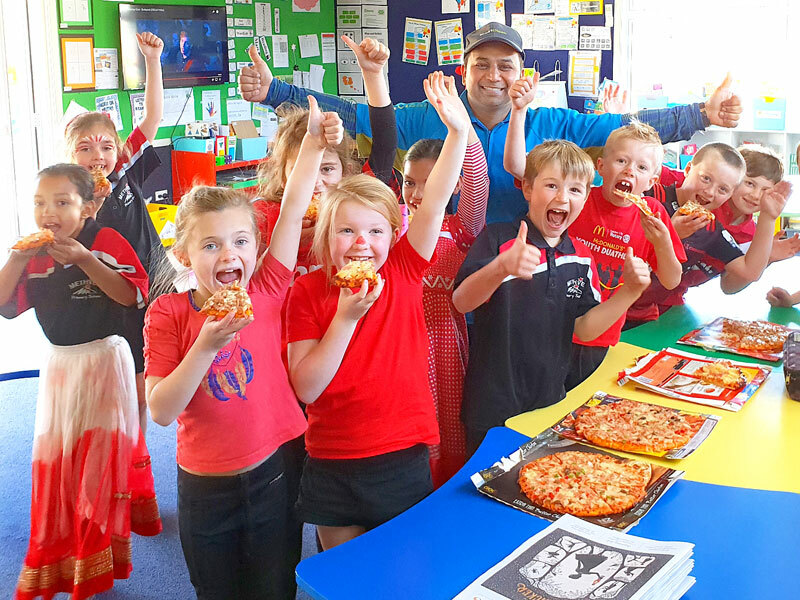 Franchise owner Randeep Singh hands out pizza to pupils at Bluestone School, Timaru for winning the Cleanest Classroom Award.